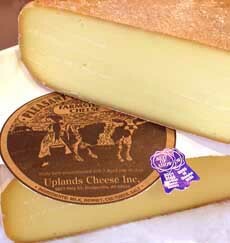 Pleasant Ridge Reserved from Wisconsin’s Uplands is the only cheese to win Best Of Show at both national cheese competitions: the American Cheese Society and the U.S. Cheese Championships. Available at iGourmet.com. STEPHANIE ZONIS focuses on good foods and the people who produce them. My name is Stephanie Zonis, and welcome to Whey to Go! for June, 2007. Every month, we’ll delve into a new cheese-related subject, and I’ll offer a recommendation on a cheese I love. This month it’s the Wisonsin cheese—brilliant cheeses crafted in America’s heartland. Ask any cheese-lover where artisanally-produced cheeses originate within the U.S., and they’ll probably tell you California, or perhaps Vermont. It’s true that some wonderful dairy products come from both of those states, but why is Wisconsin so often overlooked as a producer of fine cheeses? People seem to think that dairies in Wisconsin produce only industrial-quality cheese (usually Cheddar) in huge blocks. Certainly, there is some production of this type of cheese in Wisconsin. Wisconsin is a state of lush green pastures—perfect for the kind of dairying that produces the highest quality milk, which gifted cheesemakers then turn into superior cheeses. The state produces more then 2.4 billion pounds of cheese annually. 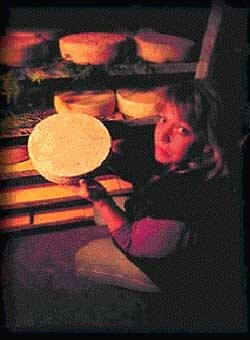 Historically known for its Cheddar and colby, Wisconsin today produces specialty cheeses such as Asiago, feta, Gorgonzola and provolone, along with some unique artisan cheeses made by boutique producers below who have developed their own recipes (most artisans also make traditional cheeses, such as Cheddar). It would be helpful here to define a couple of terms that you’ll see repeatedly in this article and others about cheese. A “farmstead” cheese is one made on the same farm where the milk is produced—that is, the cheesemaker also owns the animals and the cows, sheep and/or goats live on-site. Many farmstead operations tend to be smaller in scale (as opposed to large dairies), and take great pride in the way they care for their animals, as well as in the cheeses they produce. “Artisan” or “artisanal” cheeses are tougher to define, as both words have been usurped by large corporations seeking to disguise themselves as caring producers. I tend to favor the definition used by the Wisconsin Milk Marketing Board. According to that organization, an artisan dairy product is “often handmade, or made using relatively small-scale specialty techniques in small batches…[artisans] capture the uniqueness and special identity of each product.” An artisan cheesemaker does not own animals but purchases milk from a dairy. Carr Valley Cheese. Cow’s milk cheeses. Sheep’s milk cheeses. Goat’s milk cheeses. Carr Valley Cheese has them all; they even manufacture blended milk cheeses. In total, they make more than 50 different varieties! Proprietor Sid Cook is a certified Master Cheesemaker—one of only 49 in the entire state (and Wisconsin is the only state to offer advanced cheesemaker certification). Sid, not content with just one Master’s, got a second: He is certified in both Cheddar and Fontina. In the past three years alone, Carr Valley cheeses have won more than 60 top awards in domestic and international competitions (earning 28% of Wisconsin’s share of the American Cheese Society awards). One of my picks here is the Gran Canaria, named Best of Show over more than 600 American-made artisan cheeses at the 2004 American Cheese Society competition. It’s a mixed milk cheese—a blend of cow’s, sheep’s and goat’s milks. What makes it special is the aging process. It’s aged for at least two years, and the cheese’s rind is regularly hand-rubbed with olive oil. That olive oil must remind Gran Canaria of Italy, because this cheese shares many characteristics with good Parmigiano-Reggiano. From the lengthy aging period, the cheese acquires a concentrated flavor, though it isn’t bitter or overwhelming to the taste buds. You get some of Parmigiano-Reggiano’s deep nutty component in the taste, but Gran Canaria has a savor all its own. 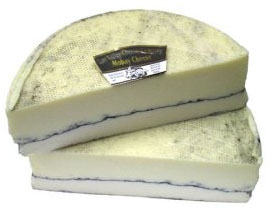 My other “cheese of choice” from Carr Valley is the unusual Mobay (shown above). Mobay has a white layer of goat’s milk cheese pressed together with a yellower layer of sheep’s milk cheese, and a “line of demarcation” formed by grape vine ash. Not only does this cheese look magnificent on a cheese plate, but you get the distinct flavors of two kinds of milk in one bite. Don’t be concerned about the presence of ash, by the way; it’s harmless to consume and adds visual interest and a bit of flavor to the cheese. Crave Brothers Farmstead Classics. The four Crave brothers (Thomas, George, Mark and Charles) have been farming together for almost 30 years. My absolute favorite of their cheeses is the mascarpone. If you are a regular reader of this column, you know that mascarpone is somewhat akin to American cream cheese, but softer, richer and slightly sweeter. The Crave Brothers version is especially voluptuous, and very much worth cheating on your diet. It’s usually used as a dessert cheese with berries, and is wonderful in cheesecake, mousse, tiramisu or simply spread on a slice of a sweet, crisp apple or pear. 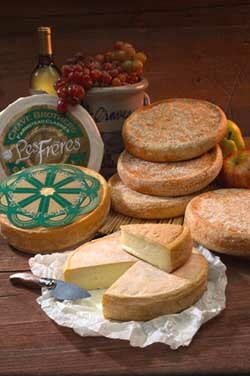 On the opposite end of flavor is the earthy washed rind wheel, “Les Frères” (which means “the brothers” in French—photo at left), with deep, fruity notes. It was a silver medalist at both the American Cheese Society and World Cheese Championships. 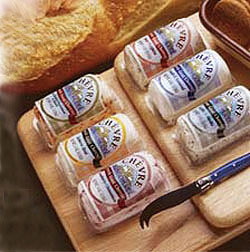 The mascarpone has won its share of awards, as have the other Crave Brothers cheeses, which you can meet on the company’s website. The cheeses can be ordered online, and are available in different venues, but the mascarpone can be found in Whole Foods Markets in the South, Southwest and Midwest; Wegman’s Markets in the Northeast; and Fairway Market in New York, among other places. LoveTree Farmstead Cheese. LoveTree Farmstead Cheese is a 200-acre spread; 70 of those acres are devoted to wild habitat, leaving more than 100 acres for the sheep and cows to graze. This area in northern Wisconsin is surrounded by many lakes, which create a particular microclimate that lends character to the farmstead cheeses as they cave age. Dave and Mary Falk, the proprietors, may be best known for their Trade Lake Cedar, a “Best Of Show” winner at the American Cheese Society competition (the sheep’s cheeses have won many awards as well). Made from unpasteurized sheep’s milk and sporting a natural rind, this cheese is aged for a minimum of two and a half months on boughs of cedar branches. It’s a beautiful cheese visually as well as in its flavor, which is complex with a long finish. Another great cheese here is The Gabrielson Lake. This is a raw cow’s milk cheese, made with the milk from a single herd of Jerseys and aged for at least three months. It’s not nearly as robust in flavor as the Trade Lake Cedar, but tends toward the sweet-nutty-buttery spectrum. The Falks note that The Gabrielson Lake is ideal company for an ale or lager beer and some good pumpernickel bread. LoveTree cheeses can be purchased online, but availability is seasonal and limited. Uplands Cheese. You’d think that a cheesemaker would have to make more than one product to survive economically, and most have a line of cheeses. By contrast, there’s Uplands Cheese and its only product, Pleasant Ridge Reserve. But, why tamper with success: Pleasant Ridge Reserve is a two-time recipient of the American Cheese Society’s Best in Show award, and was named best cheese at the 2003 U.S. Cheese Championships. Even given the usual human desire for variety, I’m not sure it’s possible to become bored with this Beaufort-style cheese, because it does so many things so well. This is a farmstead, raw milk cheese, produced from the milk of a single herd of cows—you can taste the “terroir” of the grass and herbs in the cheese. The cows graze rotationally, an increasingly popular system in this country and one that results in the pasture having a chance to recover once the herd has grazed on it. 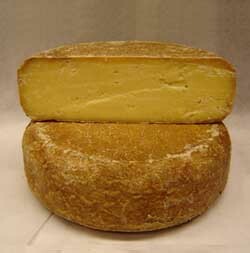 Pleasant Ridge Reserve is an ideal table cheese by itself, or you can pair it with wine, bread and/or fruit. It also lends itself to cooking wonderfully well: Try it in a grilled cheese sandwich with a good whole-grain bread, in a fondue or macaroni and cheese. Montchevre-Betin. If you’ve put off trying goat cheese from fear of a “goaty” or too strong taste, Montchevre-Betin may be able to change your mind. Try their lovely Fresh Chevre Log or Crottin, two different forms of the same cheese (a log and a smaller, round medallion). The Crottin received a gold medal at the World Cheese Competition; the log has wider distribution. I prefer the Plain variety, although a variety of flavors, such as Cranberries & Cinnamon, Garlic & Herbs, Four Peppers, Lemon Zest and Sun Dried Tomato & Basil, are available. You will find the tang of goat’s milk in this cheese, yes, but it’s in a great balance with the flavor of the milk. The website claims that this cheese has a very clean flavor, and I find that entirely accurate. This would be a perfect cheese to serve with baguette slices, fresh fruit and a Sauvignon Blanc. There is no online ordering available, but these products, under the “Montchevre” name, can be found at major supermarkets just about everywhere across the U.S.
Hook’s Cheese Company. If you’re like me and enjoy a good blue cheese, Hook’s Cheese Company has got you covered. Their award-winning Hook’s Blue Paradise is a double cream, cow’s milk standout (a double cream cheese is one made with milk, to which cream has been added, so that the final product is at least 60% milk fat—more on this subject next month). 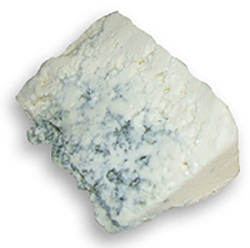 As you might expect, Blue Paradise has an exceptionally creamy texture that just melts in your mouth. The flavor of this cheese is quite robust, which is not surprising, as it’s given more aging time than the company’s Original Blue. To me, Blue Paradise cries out for a good Port to accompany it. Cheesemaker Tony Hook began by making Cheddar over 35 years ago, and I am here to tell you that he knows his stuff. Mt. Sterling Cheese Cooperative. Whether you’re a goat cheese veteran or new to goat milk, you can turn to the Mt. Sterling Cheese Cooperative, one of the United States’ largest co-ops devoted to goat milk products. You can find goat butter here, as well as a variety of milder cheeses; but those looking to ratchet things up a notch will also find their preferences catered to. Cheeses are available made from raw and pasteurized milk. Jack-style cheeses are offered in Plain, Dill, Jalapeño Pepper and other flavors; you can purchase a hardwood smoked Cheddar-style goat chunk and even goat feta. My cheese of choice from Mt. Sterling is the Raw Milk Sharp Cheddar-style Cheese. It retains the great texture of Cheddar and has enough piquancy without being biting or too much on the palate. You’ll know it’s not a cow’s milk cheese by its unique flavor. But if you don’t see the label, you might be hard-pressed to describe the difference between this and an aged cow’s milk Cheddar. The Raw Milk Cheddar Style and Fresh Jack Style were gold medalists at the World Cheese Championships. Hidden Springs Creamery. My final selection is “for lagniappe,” as they say in the South. I know I’ve already listed seven cheesemakers, but this creamery requires a provisional listing, because production is quite small and distribution is definitely limited. In part, this is because Hidden Springs Creamery is very new to cheesemaking; they’ve really just gotten started. But if Driftless is an example of their early efforts, I can’t wait to see what they’ll produce in the future! This cheese is named for the area of Wisconsin where it’s produced. It’s a farmstead sheep’s milk cheese, soft and fresh, as dreamy as a cloud and almost as delicate, except for a little hint of earthiness that lets you know it’s not a cow’s milk product. I discovered this cheese in Chicago and stashed a carton in my hotel room fridge; it was my treat every day, spread on a slice of good wheat bread with a spoonful of apricot preserves drizzled atop. The sheep are pasture-fed and rotationally grazed, and the Jensens, cheesemakers and ovine caretakers, are big believers in sustainability. Driftless is made in Natural (the only variety I was able to try); our editorial director was happily able to try the Honey and Lavender and Fresh Basil with Olive Oil. All three won honors at the 2007 U.S. 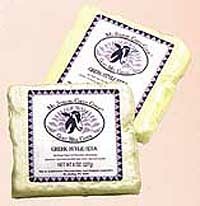 Cheese Championships, with Honey Lavender taking Best Of Class in the Soft and Semi-soft Sheep’s Milk Cheese Category. At present, the cheese is sold in stores only in select stores in Chicago, Wisconsin and Minnesota. 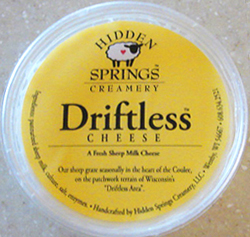 There’s a possibility you’ll be able to obtain Driftless via mail-order by e-mailing Brenda Jensen (see the company’s website) You may also be able to purchase it from Cowgirl Creamery in California, though I didn’t see it on their website. As you can see, Wisconsin products run the gamut from mild to sharp, with many different textures. For those who only know the supermarket cheeses of Wisconsin, these world-acclaimed award winners are precious cheeses that will delight the most demanding connoisseurs. If you’d like more information about dairies there, head over to Wisdairy.com. You’ll find recipes, a kids’ area, a cheese variety guide, ways to order, and far more dairy-related information than you knew existed. The next time you talk about cheeses from Wisconsin, make sure it’s with your mouth full!